We’ve completely reworked a Hanwag classic. A lot has happened since we launched the first FERRATA some ten years back. It was the first Hanwag boot made not just of leather, but also with Cordura in the upper to save weight. At the time, we wanted to develop a mountain boot that performed well on rock, but still offered good comfort. Hanwag is now exploring new terrain with the FERRATA II. We use less leather, and replace it with highly-functional modern materials. The new TubeTec Rock sole means it performs better and is 10% lighter than its predecessor. 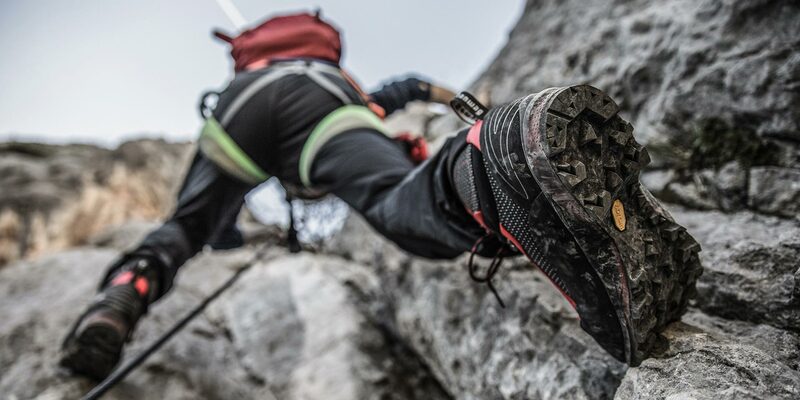 Designed for extreme via ferratas and alpine climbing, the FERRATA II has a particularly wide range of application and strikes the perfect balance between stability, performance on rock and comfort. The Hanwag FERRATA II’s timeless design combines long-lasting durability with high functionality to cover a wide range of alpine activities, such as difficult via ferratas or mixed alpine climbing on rock and ice. It’s engineered with Hanwag TubeTec Rock sole technology as its foundation. Hanwag successfully introduced TubeTec technology in its Hike category last summer. From the very first moment, we have always been exploring how to combine climbing performance in rock and ice with the best possible walking comfort. which would otherwise be too “soft” for rugged mountain use without protection. Simultaneously, internal TPU ribs provide reinforcement and enhance performance. Ribs for tread stability, precision and good cushioning. Reinforced heel front for optimal traction on descents. TPU reinforced climbing zone for perfect edging stability at the big toe. What makes the FERRATA II particularly innovative is its stable upper, which still allows the right amount of flexibility at the ankle for a precise placement on rock. This is made possible by LFX technology that we successfully introduced with the TATRA LIGHT. Due to its design, the upper moves with greater (lateral) flex to the side together with the lower leg axis. On the FERRATA II, we use a particularly abrasion-resistant fabric woven from polyamide and polyurethane yarns to ensure the stability of the upper. At the flex zones, a more flexible woven polyamide fabric is used. A further advantage is that – due to the special manufacturing process – the stitches remain concealed inside the upper. This makes the boot less susceptible to wear and abrasion out on rock. If there are no threads, there are no weak points that could get worn.